Guerrilla Alliance is composed of New Hampshire/Boston, MA native MC VEGA X: Heaven's Assassin, and The Bronx NYC ( via Delaware) MC/Super Producer Macabean the Rebel. After many past collaborations, and ultimately deciding to name the group Guerilla Alliance after their "I-Ching" collaboration, comes the album from Vega X (PXR CEO) and Macabean VP of PXR "Guerrilla Warfare"! Featuring production by Macabean the Rebel, Vee Eye, and Snake VS Crane! THE ALBUM WILL FEATURE: SHABAZZ THE DISCIPLE (T.H.U.G Angelz), ROBOT TANK (THE HOLOCAUST), ARMAGEDDON (formerly of TS) Vee Eye, Schizo Da Maddcapp, Stranga The Great, Rook Da Rukus and more! G.A. seeks to spread their revolutionary philosophy through out the hip-hop community and beyond. Since the inception of Vega X's concept tracks/music videos "Invasion" and "1984" it was repeatedly asked of him, when would he do another concept track? The answer is NOW. SEVERAL concept tracks are included on the "GUERRILLA WARFARE" LP. Including topics such as WWII, and another special current event story track titled "Systematic Genocide". We are proud to have the GA/GW release as PXR's first full length effort. As far as our personal perspectives on spirituality, and socio-political-economic current events much of that is covered on our debut album so we will neglect that here and concentrate on the music. We would like to thank everyone who was apart of our album. 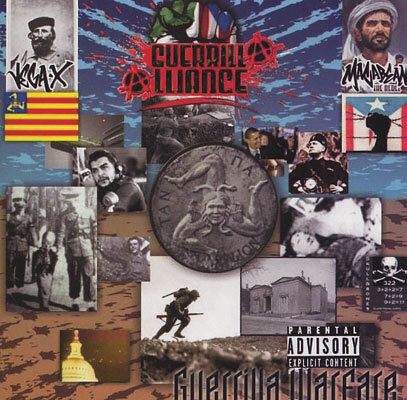 LOOK OUT FOR GUERRILLA ALLIANCE: "GUERRILLA WARFARE" OUT EVERYWHERE NOW!! !